The PGA and it’s broadcast partners CBS, NBC, and the Golf Channel have teamed up to provide live streaming of all their PGA Tour broadcast events in 2013. For those events on NBC and Golf Channel you have a couple of options for watching on mobile devices, including the Golf Live Extra App. NBC had already made the PGA Tour events available through it’s NBC Sports Live Extra app. 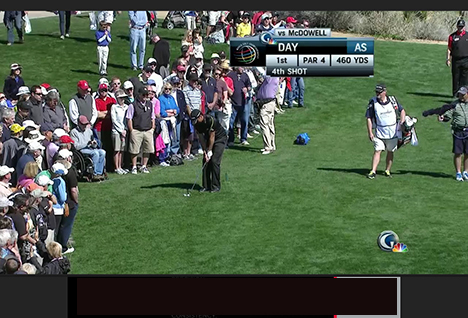 The Golf Live Extra is essentially just NBC Sports Live Extra app without all the non-golf related content. The good news is that everyone will be able watch the PGA Tour coverage that’s broadcast by NBC via the app. You’ll also get access to all the on demand video segments Unfortunately only certain authenticated users will be able to watch the Golf Channel coverage. If you are a cable subscriber with Comcast Xfinity, Verizon FIOS, Cablevision Optimum, or Suddenlink, you’ll also be able to log in and watch Golf Channel content. Otherwise, it’s only NBC coverage for you. One additional issue I’ve noticed is this growing trend of the networks kicking the coverage over to the Golf Channel when their coverage runs long. When NBC does this, the live stream on the Golf Live Extra app is also cut off and leaves those who can’t authenticate to access the Golf Channel live stream out in the cold. It doesn’t happen on every event, but it is a bit of a kick in the teeth to those that have just invested 3 hours watching a golf tournament and then don’t get to see the ending. With CBS, I’ve noticed that (so far) their lives stream continues even after they throw coverage to the Golf Channel. If you’ve used NBC Sports Live Extra then you already know how this app works. As I mentioned, it’s basically the same app. So, if you already have NBC Sports Live Extra, you don’t really need this app unless you only plan to watch golf. I’m not even sure why NBC released Golf Live Extra as a separate app, unless it just makes it easier to market an app to the pure golf fans. As far as performance, we’ve tested it on the iPad and iPod Touch and it works quite well. It’s currently rated at about 2 1/2 stars in iTunes, but most of the negative ratings appear to be coming from those complaining about the lack of eligible cable partners. For those PGA Tour events broadcast by CBS, you’ll want to pick up the CBS Sports App. 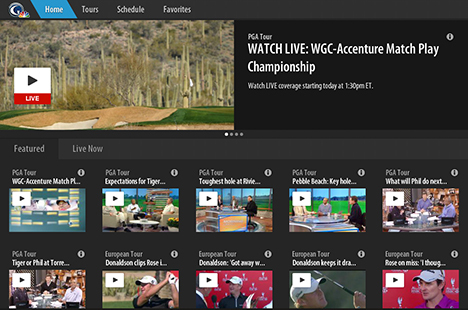 If you aren’t sure who is broadcasting a particualer event, you can view the 2013 PGA Tour TV schedule here at PGA.com.